Add some arctic charm to your bookshelves with the Iceberg Bookend and Bookmarks! This characterful book end will keep your favourite lit organised whilst adding a quirky talking point to your home. But the stylish design is just the tip of the iceberg (bad um tsch!) 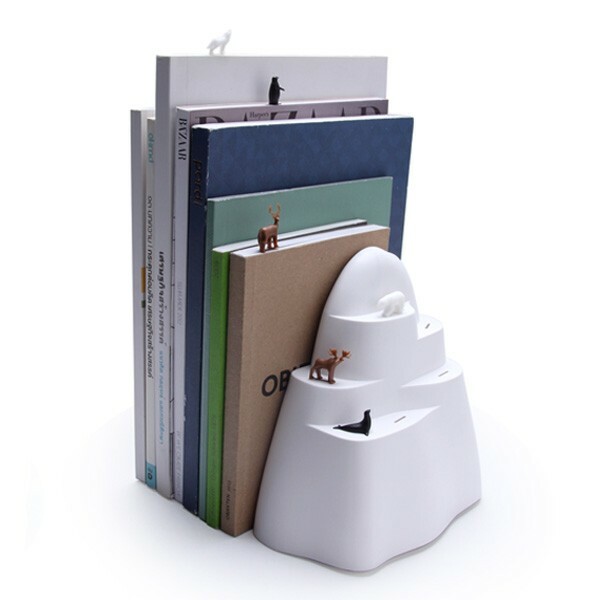 This wonderfully quirky design also includes six integrated plastic animal bookends, which peep out the top of your chosen books to help you find your last page in an adorable way! Featuring a polar bear, penguin, moose, arctic wolf, seal and stag, when not in use, these plastic bookmarks seamlessly slot into the hollow iceberg to make it appear as though they are standing on one of the ice shelves. This wonderful design-led creation from Qualy would make a delightful gift for keen readers - especially nature lovers! See on the right for more quirky book ends, including a matching green mountain bookend.